The X-Men has long since been my favorite group of super heroes. I have often wondered what it was during my childhood that attracted me to the X-Men more than any other group of super heroes in the Marvel or DC Universe. Was it that I thought they had the best powers, did they have the coolest characters, or was I most intrigued by their story lines? I found myself most readily able to identify with the X-Men because I saw myself in the mutant species. It is no secret that the X-Men series is rich in metaphors for the Civil Rights struggle. In both the X-Men comics and in X-Men TAS Charles Xavier is an allusion to the Civil Right leader Martin Luther King Jr. Even though the X-Men save the world on a weekly basis they struggle to find acceptance, for no other reason than because they are mutants. It was this connection that fueled my intrigue with the X-Men film franchise. Indeed the most recent film X-Men: Day of Future Past is rife with analogies and parallel to both past and modern Civil Rights struggles. For the record the X-Men series in all forms has great limitations in its use as an analogy to the struggle for Civil Rights. Nevertheless, as I reflected on the film and the history of the film series I found that the most provocative feature of the film was the deeper meaning found through how the film questions what it means to be human and perhaps more importantly what it means to be “not human.” In light of this question it becomes important to examine what factors have motivated ethical treatment for those considered human and “not human.” As I reflect on the realities that depict “humans” and “non-humans” I am reminded of the writings of Giorgi Agamben and his work entitled Homo Sacer: Sovereign Power and Bare Life. Agamben describes the process by which groups of people become labeled as “not human” using the term homo sacer. In ancient Rome the homo sacer was a criminal who was declared an unperson. They were deemed inadequate as a form of sacrifice, while simultaneously not receiving any protection from the law. Without any form of protection from the law through being stigmatized as the unperson, the homo sacer is left with no recourses and thus is a bare life. Agamben analysis of the homo sacer as the unperson, who is without protection, rights, or official recognition. The nation- state is capable of labeling undesirable people within a particular context as the homo sacer. This adequately describes the treatment of the mutants throughout the X-Men film series. They are not given the provision of protection by the government through the legal system. There is no vote on their systematic extermination the perceived fact that they pose a great threat to society far outweighs any rights of humaness that they may have. This feature is exemplified by Bolivar Trask initiative to exterminate all of the mutants because of the threat that they pose in X-Men Days of Future Past, and through the passing of the Mutant Registration Act in X-Men the Last Stand. Both acts are guided by a conscious decision to protect the “humans” from the “not humans.” The distinction between who is considered human and “not human” is clear. It resonates with the treatment of the immigrant population who are forced to “prove” their citizenship and in many instances seen as a threat to our borders. It also resonates with racial and ethnic minorities living in an Urban setting, who are disproportionately killed by our justice system to keep our “streets safe.” In both instances government protection and human status are sacrificed for the perceived safety of the community. Merely examining Agamben’s notion of the homo sacer as the “not human” falls short of a nuanced understanding of examining ethical treatment of humans and “not humans.” To do this one must look at some of the root causes of how one receives the label of homo sacer. Again the X-Men series is helpful towards examining one of these causes as well. An implicit message that pervades the entire X-Men film series is that both mutants and humans fear what they do not completely understands. Mutants such as Rogue and others fear the humans not only because of whatever damage they can do to them but also because there lack of understanding of the human race. Rogue in a physical level can never understand the ways of humans as she is not able to even touch one without killing them. She still suffers from the the trauma of from touching her first boyfriend and rendering him unconscious. She is also afraid of her own powers because of the damage it can down, her inability to control them, and how little she really knows about her power. More obviously, humans fear the mutants not solely because of the power but also because of they can not fully comprehend the mutants power. Despite the X-Men consistently saving the world humans still question their intentions and the extent to which they use their powers. Even in X-Men TAS the phrase “people fear what they do not understand” is stated twice in the first two episode to make even more explicit this motif in the X-Men series. This at a very basic level alludes to what can be deemed as the chimeric quality of ethical treatment. In Greek mythology the Chimera is a mythical creature sort that is a hybrid of several different creature and is a fire breathing dragon. However, more importantly it as creature that has never been. No one in Greek mythology is said to ever encounter it through personal experience. It exists through fear and the imagination. Despite this in Greek mythology it provokes a very real and visceral emotional reaction. Thus the chimeric quality of ethical treatment is the way people are treated based on the fear of the unknown. Whether it be Mark Cuban’s comments describing his reaction to seeing a black man in a hoodie on the street or a white man covered in earrings. In both instances he said he would cross to the other side. Although there are definite racial undertones to this statement he is also very specifically alluding to the fear of the unknown. In both instances he is not afraid to admit that he is scared of what he does not know about either person. Unfortunately, in 21st century America the unknown is too often equated minorities and people of color. Whether it be Trayvon Martin walking in a predominantly white neighborhood, or John Crawford III ( fatally shot because he was playing with a toy gun in Walmart and someone got suspicious), the chimeric quality of ethical treatment is a major threat to the bodies of people of color. Just as mutants both good and bad are murdered in the X-Men series on the basis of their perceived threat because of their unknown abilities; scores of minorities are also murdered daily and deemed as “not human” because of their unknown qualities. Realizing the dangers posed by the chimeric ethical treatment model can serve as one way to begin to form a more nuance understanding on how to distinguish that which is considered human and “not human.” Humaness as a general category should imply the fair and ethical treatment of all people regardless of perceived chimeric qualities. While the “not human,” is that which does not provide this basic ethical treatment for everyone. This articulation of humaness is exemplified in several instances in the X-Men film franchise. Perhaps most poignantly is at the conclusion of X-Men Days of Future Past. Mystique finds her own humaness by saving the life of Bolivar Trask. Trask, one of the major antagonist of the film commits a plethora of act making deserving of the title “not human,” including being responsible for the Sentinel program aimed at totally annihilating the mutant population. He appears to not be worthy of such ethical treatment by Mystique. However, by seeing the humaness in everyone she is able to find the humaness within herself. She simultaneously dismisses the chimeric quality of Bolivar Trask as well as the uncertainty of what will become of the mutants in the future. Although both she and the X-Men series do not provide an explicit solution to understanding way of providing the ethical treatment to that which is considered “not human” both certainly provided a starting for this discussion. For a possible Foucauldian take on the original X-Men trilogy, see Rod’s 2010 post: Re-Watching the X-Men Trilogy. This entry was posted in Political Jesus and tagged Giorgi Agamben, Marvel Comics, politics, racism, Trayvon Martin, X-Men, X-Men: Days Of Future Past on August 29, 2014 by Richard. Check out the introduction for background on this series of posts! Check out part 1: Green Lantern. Check out part 2: Captain America.Check out part 3: Wolverine. Check out part 4: Power Girl. Check out part 5: Aquaman. Check out part 6: Luke Cage. Check out part 7: Iron Man. Check out part 8: Spider-Man. Check out part 9: Wonder Woman. Check out part 10: John Constantine.Check out part 11: The Incredible Hulk. Check out part 12: Batman. Check out part 13: Static. Check out part 14: Black Canary. Check out part 15: Superman. Check out part 16: Thor. Check out part 17: the Phantom Stranger. Check out part 18: Green Arrow. Check out part 19: the Flash. Check out part 20: Animal Man. What were the final scores? Before I comment, I want to make a critique of my methods. First, my categories were too binary. There is a large difference, for example, between the worldview of Animal Man and the worldview of Luke Cage, but the binary “yes or no” did not leave much room for exploring that. In fact, I admit I fudged the numbers a bit by using decimals when that binary became too restrictive. If I were to revisit this series again, I would use a scale of some sort, not a yes/no. Second, this list is nowhere near as diverse as I would have liked. While I did speak about race and gender to some degree, there remains a lack of diversity on my list. Given unlimited time and energy for this project, I should have included Cyborg, Steel, Storm, Black Panther, Falcon, Batgirl/Oracle, Supergirl, Katana, Black Lightning, Vibe, Stargirl, and others as representatives of minorites. 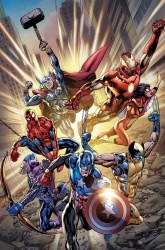 But instead, I chose the representatives that I already had some affection for, and contrasted them with the more standard heroes of the Avengers and Justice League. Third, there are doubtless many other heroes that I could have reviewed that would have scored much higher than those represented here, and certainly there are heroes that are not represented that are fan-favorites of people very near and dear to me. To you folk, I apologize. I simply ran out of steam for the job, and people were already threatening to boycott Political Jesus if I continued, lol. So perhaps one day, I will give Blue Beetle, Jean Grey, Nightcrawler, Rogue, Gambit, Nightwing, and Boris the Beat their due, but it won’t be today. Having said all that, I believe that I am in no shape to give a whole-hearted devotion to a super-hero the way I have done for Green Lantern in the past. In dissecting these heroes over the last few months, I have gained an appreciation for them beyond how they fit into my categories. Phantom Stranger and Constantine rated very low, but why do I enjoy reading them so much? Thor rated fairly high, but I have little desire to read his book monthly just because he did well on my list. Still, there were a few heroes that really outshone the competition and made me appreciate who they are. Spider-Man and Superman are heroes that have always been in my periphery. I tend not to like more mainstream heroes. But I simply cannot deny that they represent the best of who we want to be. I am now committed to diving into their stories a bit more over the coming year. I was surprised Hulk rated so high, but Hulk has always been a favorite of mine, especially in his Savage (childlike) persona. The true front-runner (no pun intended) however, is the Flash. He surprised me. I have been reading a lot of these heroes in preparation for this blog, but I was really struck by the Flash in a way that the others didn’t strike me. In particular, his boundless hope and his humanization of even his enemies, and unwillingness to settle for anything other than the best outcome was truly inspiring. And I don’t mind saying that this is coming at a great time for Flash fans, who have a TV show on the horizon, a great comic to follow, a whole slew of t-shirts to wear, and a new advocate on Political Jesus. The new Flash fan – ME! This entry was posted in Political Jesus and tagged Action Comics, Barry Allen, Blerd, comic movies, DC Comics, Geek, Marvel Comics, television, The Flash, Wally West on November 19, 2013 by Optimistic Chad. Check out part 1: Green Lantern. Check out part 2: Captain America.Check out part 3: Wolverine. Check out part 4: Power Girl. Check out part 5: Aquaman. Check out part 6: Luke Cage. Check out part 7: Iron Man. Check out part 8: Spider-Man. Check out part 9: Wonder Woman. Check out part 10: John Constantine.Check out part 11: The Incredible Hulk. Check out part 12: Batman. Check out part 13: Static. Check out part 14: Black Canary. Check out part 15: Superman. 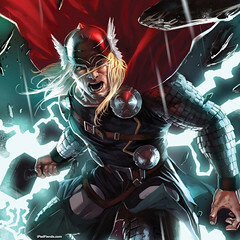 Thor is the Norse mythological god of thunder. He interacts both with the Norse pantheon of gods and monsters in Asgard, as well as with mortal here on Midgard (Earth). He is incredibly strong (almost as strong as the Hulk), and along with his mighty hammer Mjolnir, he can pretty much beat down anything in creation. Unfortunately, his brother is the god of trickiness and causes him no end of trouble. Does this character have a spirituality? He is a god, after all… So yeah. He is drowning in it. However, his spirituality is sortof pale considering that his pantheon of gods acts more selfish and petty than many humans. Also, Thor isn’t ever seen dealing with the ramifications of being worshiped. It would be nice to see that explored from a god’s perspective. This entry was posted in Political Jesus and tagged Blerd, Geek, Marvel Comics, thor on November 18, 2013 by Optimistic Chad.